*Alakśendra Priya Vṛkarāja is an American Sanskrit student and Religious Studies Scholar at Florida International University in Miami, Florida. He has written many articles on Buddhism, Hinduism and Mysticism. 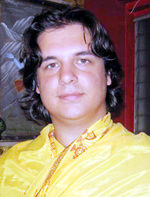 He is currently completing his Master's thesis on the effects of Kashmir Shaivism on Adi Shankara's Advaita Vedanta. He has studied spirituality and mysticism in both its orthodox and unorthodox forms. Nice and beautiful. You have typed all the Raudri--RudraMantra, as well ,in the Vedic font. Mahamritunjaya Mantra is the powerful,of the Vedic literature. It transcends the narrow boundaries,as this the Vision of Shiva. May Shiva bless you! Thank you for the translation of the Mahamrityunjay mantra, with a breakdown of the lexical items and parts of speech. I have a general sense of its meaning, but had wanted to know for sure what Urvarukamiv meant exactly. In the verse structure, that phrase is highlighted since it marks a transition of the main thought towards its extension.